We'll show you how to get a US IP address from outside Australia so you can access your favorite shows, content and apps (including Netflix) from abroad. We'll also show you a clever trick to get a top-rated VPN free for a month. Having access to an Australian IP address is on the priority list for a number of people. Aussies living abroad may need it to access online banking services. Australian residents traversing the globe require an IP address from back home to stay in touch with sporting events like the Australian Open or local television content, such as that provided by Foxtel and 7plus. 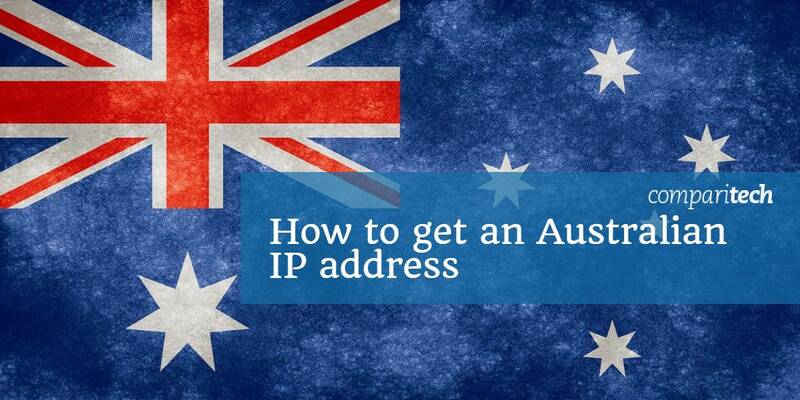 In this guide, we’ll explain some methods of how to obtain an IP address from Australia, including a free method. The easiest and quickest way to do that is by using a Virtual Private Network (VPN). A VPN encrypts all the traffic flowing to and from your device and routes it via an intermediary server. This makes it appear you’re accessing the web from outside your current location. Lots of top-tier VPN companies offer servers in Australia, which means you can be based anywhere in the world and still acquire an Australian IP address. ExpressVPN Our #1 choice for getting an Australian IP address. Super fast servers that unblock most popular streaming sites. Strong security, no logs, and 30-day money-back guarantee. NordVPN Veteran provider with a vast server network. Zero logs and impeccable security. Decent speeds. CyberGhost Budget alternative with top security, fast speeds, and no logs. PrivateVPN Impressive speeds and can unblock pretty most geo-blocked content while abroad, including Netflix. What are the steps to get an Australian IP address? The most straightforward method to obtain an Australian IP address is to sign up for a paid VPN service. We’ll highlight appropriate ones over the course of this article. It doesn’t matter where you’re located in the world – it could be the US, France, Germany, Canada, the UK, India, Singapore, Thailand, or elsewhere – the process to obtain an IP address from Australia is simplified with a VPN. Register for the VPN service and download the app relevant to your device. We recommend ExpressVPN. Clear all cookies and restart your device. Connect to the VPN mobile app or desktop client. Select a server in Australia and wait for a stable connection. Now you’re in possession of an IP address from Australia and can enjoy unrestricted access to a host of websites and content. TIP: HOW TO GET A GREAT PAID VPN FOR FREE: The cheapest deals for top-tier services usually require commitments of a year or more. We’re aware that many users don’t need access to a VPN for such a long duration of time. If you’re on your annual vacation and need a VPN service for less than a month, we recommend that you take advantage of ExpressVPN’s 30-day money-back guarantee. You will need to pay upfront initially but the company offers a ‘no-questions-asked’ refund if canceled within the first 30 days. We haven’t heard of any instances where this commitment was not adhered to, so it’s evidently risk-free. Of course, this offer is still available whether or not you’re a holidaymaker. What’s the best VPN to acquire an Australian IP address? ExpressVPN is a fan favorite because of its reliable service, fast speeds, and minimalist design. At the moment, ExpressVPN offers more than 1,500 high-speed servers spread across the globe. Servers in Australia are plentiful and there are options in nearby countries too, including New Zealand, Indonesia, and Singapore. ExpressVPN’s standout feature is its continuing ability to unblock geo-restricted content including Netflix, Hulu, BBC iPlayer, Fox, Sky, and more. The service makes use of military-grade encryption protocols. This means your connection is encrypted and secure at all times. Specifically, ExpressVPN incorporates 256-bit AES-CBC as the default encryption standard along with HMAC authentication and perfect forward secrecy. An internet kill switch is included, which it refers to as a ‘network lock.’ The latter feature means that your connection will remain encrypted even if the connection to a server drops out of the blue. The company has a policy of not storing any detailed traffic logs on its servers. There is a slight bit of metadata retention, but that ultimately helps users as it’s used to improve overall service quality levels. Individual IP addresses will not be logged. ExpressVPN offers apps for Windows, MacOS, Android, and iOS. BEST FOR AUSTRALIA:ExpressVPN is our first choice. It’s fast, reliable, very easy to use, and easily unblocks a ton of streaming services. Comes with top-notch security and privacy features. There is a 30-day no-quibbles money-back guarantee so you can try it risk-free. NordVPN operates 193 servers in Australia. These are a part of a total global network of more than 4,500 in 62 countries. The service is fast, highly customizable, and comes with all the bells and whistles that you would expect from a modern-day VPN. This provider is proven to unblock geo-restricted content with ease. It’s one of the rare services that works with Netflix and offers support for other streaming providers, too. As mentioned earlier, NordVPN offers a plethora of customizable features. These include an option to select a server based on the specific mode of accessing the internet such as streaming TV, ultra-secure privacy, anti-DDoS, and more. The encryption standards it deploys are hardy and robust. NordVPN uses the 256-bit AES protocol by default coupled with 2,048-bit SSL keys. DNS leak protection is enabled. The service doesn’t log user data or any form of personally identifiable information. This means you can stay hidden online without any concerns about data pilferage. Apps are available for Android, iOS, Windows, and MacOS. BEST BUDGET VPN:NordVPN is a strong all-rounder, unblocks popular streaming sites, has a huge network of servers, fast speeds and plenty of security features. 30-day money back guarantee. CyberGhost used to be a run-of-the-mill provider with a limited selection of servers and weak encryption. However, the service has dramatically improved over the past year after its acquisition by Crossrider – an Israeli firm registered in the UK. It’s gone through a rebranding phase with a clear investment in streaming capabilities, improving the server network, and firming up encryption standards. At the moment it offers a choice of 50 servers in Australia, part of a global network that numbers more than 2,300 servers sprinkled across 60 countries. CyberGhost manages to evade restrictions for a host of streaming services, including Netflix. It also offers a bunch of nifty add-ons, including an ad blocker, anti-malware defense, and anti-tracking. All traffic is secured by 256-bit AES encryption on the OpenVPN protocol by default. This is coupled with perfect forward secrecy. An internet kill switch is included. The company is headquartered and registered in Romania where laws don’t require mandatory data retention for VPN providers. EXCELLENT VALUE:CyberGhost has thousands of servers worldwide. Features high-speed servers, live chat support and excellent security. 45-day money back guarantee. Here’s our in-depth CyberGhost review. IPVanish has a total of 61 servers in Australia as well as 4 in neighboring New Zealand. Its total global network encompasses over 1,000 servers spread across more than 60 countries. The service is fast, private, and has minimal downtime. This provider emphasizes speed, security, and privacy, and works seamlessly with a bunch of streaming services. These include BBC iPlayer, HBO Now, Amazon Prime Video, and Sling TV. Encryption standards put IPVanish firmly in the top-tier of VPNs. It uses 256-bit encryption on the OpenVPN protocol by default, SHA512 authentication, and a DHE-RSA 2,048-bit key exchange with perfect forward secrecy. Its policy of nil data storage makes it an example of a completely logless provider. This service is popular with Kodi users because it enables them to download the Android APK directly to their device. The interface is also remote control-friendly for Kodi devices that lack a keyboard and mouse. GREAT FOR PRIVACY:IPVanish is a good option for torrenting. With good speeds, and 10 connected devices allowed, IPVanish is popular for torrenting and Kodi users who want to share a subscription. Doesn’t work with some streaming services such as Netflix, Hulu and others. 7-day money back guarantee. PrivateVPN has a smaller choice of server locations as compared to the other providers on our list. But that shouldn’t discount its offering in any way. At the time of writing, the company offers a 30-day money-back guarantee on all packages. Globally, PrivateVPN offers just over 80 servers in 56 locations, with one server located in Australia. This provider is able to unblock popular streaming services including Netflix, BBC iPlayer, ITV Hub, and many more. Its speed and privacy ranking are on par with the other providers mentioned in the article. PrivateVPN uses 256-bit AES encryption along with perfect forward secrecy on the OpenVPN protocol. These are industry-leading standards. An internet kill switch is offered too. The service doesn’t store any user logs or engage in data mining of any nature and it offers impressive value for money. IDEAL FOR STREAMING:PrivateVPN has fast servers which makes it ideal for streaming Netflix, Amazon Prime Video and BBC iPlayer. 30-day money back guarantee. Here’s our full review of PrivateVPN. Can I use a free VPN to obtain an Australian IP address? When you’re browsing on the internet in the hunt for a suitable VPN service, it’s inevitable that you will come across tons of advertisements for free VPNs. These services are tempting because you can sign up without a credit card or any long-term commitment. However, that’s usually where the allure ends. The experience that such services offer is unreliable at best and can be downright intrusive too. Free VPNs offer a tiny choice of servers, deploy weak encryption standards, and may throttle your connection if too many users try to log in. Some free VPNs have been caught stealing user data and selling it to advertisers. You might get lucky and be able to connect to an Australian server but it definitely won’t be hassle-free. If your aim is to stream content or securely access financial services, then you’re putting yourself at huge risk by opting for a free VPN. A free VPN should raise eyebrows because there’s definitely a catch involved. They’re trying to profit off you somehow; this might manifest itself in migraine-inducing popup advertisements or frequent cuts in service in order to convince you to upgrade to a premium version of the service. We don’t believe such providers are worth the immense trouble you will inevitably put yourself through. It’s best to opt for one of the reputable paid VPNs recommended on our list. I’ve decided on a VPN. What do I do next? We encourage you to read our user reviews of each VPN service before settling on a provider. Once that’s done, all you need to do is sign up with your credit card information (an easy way is to click on the links beneath each mini-review). You should receive a confirmation email with your login information and links to the relevant apps. Proceed to download those directly from the website or relevant app store. Restart your device after the installation is complete. Once your login information is successfully authenticated, the VPN service should ping you about a list of available server locations. Browse through them until you find an option for Australia. Some providers let you select a server based on country alone, while others let you select by city. A successful connection will normally be indicated by a green icon on your taskbar or a VPN symbol at the top of your smartphone screen. Now your connection will be anonymous and secure, and you’ll be browsing the internet with an Australian IP address. Why do I need an IP address from Australia? Access to broadband internet is a fundamental human right down under. The government doesn’t censor content and generally allows citizens the right of free speech as long as it doesn’t fall in the category of libel. An IP address from Australia can help if you’d like to access the free and open web. Normally that’s not available to citizens of countries like Iran, China, Russia, and the UAE where the state dictates what content citizens can access. Australians traveling abroad will find it useful to obtain an IP address from back home. This helps access content from sources such as Foxtel, 7plus, Australian Netflix, ABC, and SBS. You can also access other great content from all over the world, including US Netflix, BBC iPlayer, and Sky Go. If you’re looking to access a VPN while currently resident in Australia, then read our detailed guide on the topic. DISCLAIMER: Comparitech does not encourage using a VPN to stream content illegally. Please consult local laws before deciding to embark on this route. If you have any questions, then it’s best to talk to a lawyer in your country of residence. Your IP address is just one method websites use to determine your actual physical location. DNS, or Domain Name System, operates as a hybrid registry where web names (domains) are verified with IP addresses. When you try to access content that’s restricted to a certain country or region, the website or app in question will check where the DNS request originates from. If there’s a mismatch between your IP address and the DNS request, the website will block you. Therefore, it’s important for both of them to appear from the same location. Some of the recommended VPNs in this article offer DNS leak protection. All of them incorporate a robust product so your DNS requests will also be routed through the same encrypted tunnel when connected to a VPN server. These providers operate their own private DNS servers, so your ISP cannot snoop on your web activity by simply monitoring DNS requests. Some free VPN services will send your DNS requests through the encrypted tunnel but then use a public DNS service on the other side. This can be construed as a potential invasion of privacy. It’s possible to manually configure DNS servers on most devices. OpenNIC can do the trick for you; it offers free DNS servers in specific countries. What are the other methods to obtain an Australian IP address? Other than paid VPNs, there is an option of downloading the Tor browser. It’s a product of the Tor project, which aims to shore up global efforts against surveillance and network intrusion. The Tor browser is free to download and use. It has been meticulously engineered and incorporates sophisticated encryption and anonymity standards. It’s popular with people such as journalists, human rights activists, and whistleblowers as it keeps them hidden on the internet. But Tor isn’t a great option if you want to stream HD video or engage in online financial dealings. Ordinarily, speeds will be extremely stunted which isn’t ideal for watching Greys Anatomy. You can still choose to get an Australian IP address with Tor if you so desire and this guide will break it down in more detail. A second option is to engage a free proxy server. However, these are similar to free VPNs in that they operate with data caps, a small selection of locations, and shady privacy policies. Plus, most streaming providers like Netflix have started to block proxies and there’s a high chance of them not working the way you want them to anyway. At the same time, proxy servers don’t encrypt your traffic the way a VPN does. So if you try to access banking services using this method, you’re leaving yourself susceptible to hackers. 1 What are the steps to get an Australian IP address? 3 What’s the best VPN to acquire an Australian IP address? 14 Can I use a free VPN to obtain an Australian IP address? 15 I’ve decided on a VPN. What do I do next? 16 Why do I need an IP address from Australia? 18 What are the other methods to obtain an Australian IP address? 9 Can I use a free VPN to obtain an Australian IP address? 10 I’ve decided on a VPN. What do I do next? 11 Why do I need an IP address from Australia? 13 What are the other methods to obtain an Australian IP address?